Welcome to the AzerothCore Docker guide! It’s very easy! Docker will do all the dirty work for you. Forget about platform-specific bugs. When using Docker, AzerothCore will always run in Linux-mode. The total amount of RAM when running all AzerothCore docker containers is less than 2 GB with no players online. When used on GNU/Linux system, the amount of memory used by Docker is even less. The only requirements are git and Docker. 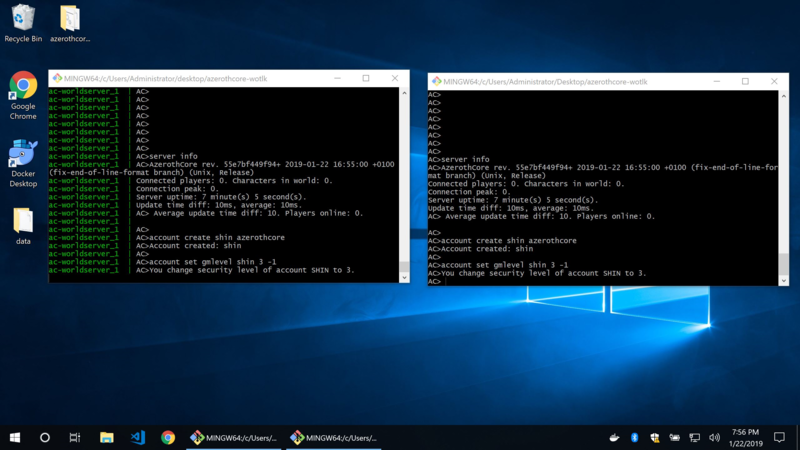 Note for Windows users: you can use git-bash (the shell included in git) as a terminal. Now cd into the main directory using cd azerothcore-wotlk. All commands will have to be run from this position. You also need to have the data files. Check the step “5) Download the data files” from the installation guide. Put your data files into the docker/worldserver/data/ folder that is inside azerothcore-wotlk. Inside your terminal (if you use Windows, use git bash), run the following commands. Don’t panic. Your server processes are simply waiting for the database container to be ready, it can take a while (depends on your machine). Your server will be up and running shortly. To access your MySQL database we recommend clients like HeidiSQL (for Windows/Linux+Wine) or SequelPro (for macOS). Use root as user and 127.0.0.1 as default host. The default password of the root DB user will be password. For server administrators, we recommend to read the Docker documentation as well as the Docker Compose reference. If you want to be an administrator of an AzerothCore production server, it helps if you master the basics of Docker usage. Feel free to ask questions on StackOverflow and link them in the #support-docker channel of our Discord chat. We will be happy to help you! Where are the etc and logs folders of my server? 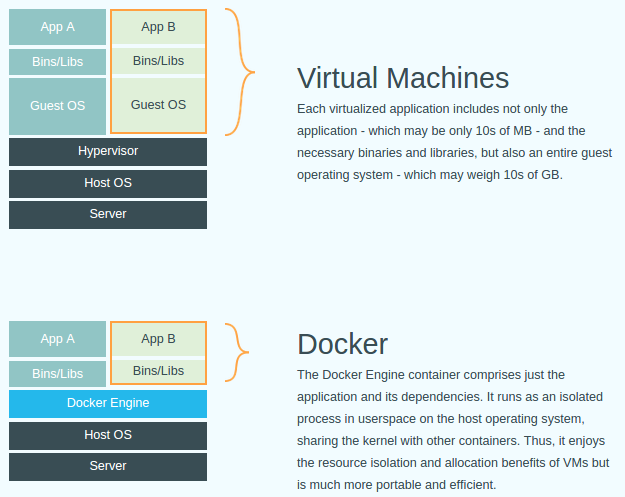 By default they are located in docker/authserver/ and docker/worldserver/. How can I change the docker containers configuration? You can copy the file .env.dist, renaming the copy in .env and editing it accordingly to your needs. Then your docker-compose up will automatically locate the .env with your custom settings. How can I start, stop, create and destroy my containers? The docker-compose start will start your existing containers. The docker-compose stop will stop your containers, but it won’t remove them. The docker-compose up builds, (re)creates, and starts your containers. The docker-compose down command will stop your containers, but it also removes the stopped containers as well as any networks that were created. How can I run commands in the worldserver console? You can easily attach/detach from the worldserver console. First of all, type docker-compose ps to know the name of your worldserver container, it should be something like azerothcore-wotlk_ac-worldserver_1. To detach: press ctr+p and ctrl+q. Do NOT try to detach using ctrl+c or you will kill your worldserver process!